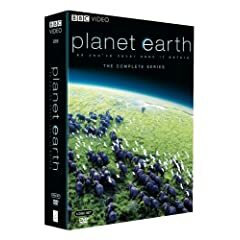 One of my Christmas presents from my parents was a complete set of the truly wonderful BBC nature documentary Planet Earth. The breath-taking photography and phenomenal visuals provide a sweeping glimpse into the fascinating and epic variety of life on the planet and serve as a shining example of how inspirational and educational wildlife documentaries can be. While the scope of Planet Earth (five years in production, 2,000 days in the field, and 40 cameramen in 200 locations) is at a whole different level than our little project, it certainly serves to remind me why I am passionate about wildlife documentaries and the impact that they can have. The start of 2008 also brought something new and exciting to this blog – my first comment. It was a wonderful feeling to get an email confirming that a stranger had read something that I had written and thought enough of it to leave a note. I found myself thinking about who andrew@bengo-music.com was and where in the world he was located. I just hope that there will be more. This entry was posted on Friday, January 11th, 2008 at 5:47 pm	and is filed under The Wild World. You can follow any responses to this entry through the RSS 2.0 feed. You can leave a response, or trackback from your own site.